Every nutritionist would advocate the use of raw honey over processed honey. This brings us to the question as to what is the difference between the two terms. Honey should be honey after all. However, it is not so. The honey you find in the supermarkets is in fact processed honey. It has its uses and advantages. There is no doubt about it. However, it does not have the rustic qualities you can expect in raw honey. This calls for an answer to what is raw honey and why should one prefer raw honey over processed honey. Everybody knows that bees produce honey. This implies that the apiary would be the best place for you to procure raw honey. Technically speaking, raw honey is unheated, unpasteurized, and unprocessed honey. To put it in simple words, raw honey is the honey you get directly from the honeycombs. What differentiates raw honey from processed honey? Raw honey comes straight from the honeycomb. 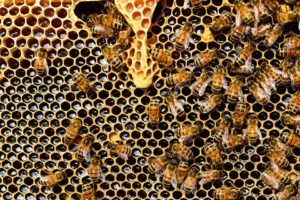 Hence, it potentially includes everything coming out of a beehive such as honey, beeswax, pollen, propolis, royal jelly, as well as the bees. This is the absolute raw honey. You can then subject it to filtering in order to remove impurities such as beeswax and so on. You do not subject this raw honey to any form of heating. It must only be subjected at normal temperature which is around 35oC. At this condition, this result into an opaque and a significantly viscous type of liquid. In order to make it look presentable, the honey processors subject this honey to pasteurization. Pasteurization means heating the liquid up to a temperature below its boiling point in order to remove the bacteria and the germs. In doing so, you tend to lose certain vital ingredients too. You get this honey on the supermarket shelves. They are effective, but in a lesser quantity in comparison with the raw unprocessed honey. This is a new term in use today. Bees collect the nectar from flowers. You usually spray chemicals on flowers to prevent weeds and pests. The organic way of farming does not use harmful chemicals. In case, the bees collect the nectar from such organically grown flowers, the honey they produce is raw organic honey. Naturally, this honey does not contain any traces of chemicals and hence is more beneficial for health. • This honey contains all the vitamins, nutrients, and enzymes intact. • This honey displays antiviral and antifungal properties. • As it contains powerful antioxidants, it can help you ward off allergies and stabilize your blood sugar levels. • You can boost your immunity by consuming this honey. • In addition to promoting digestive health, this honey helps in healing skin conditions. Raw honey, as you have seen contains bee pollen among other parts. Bee pollen is one of the nature’s most nourishing foods. You can find an amazing content of amino acids in bee pollen. Bee pollen has great use in weight control, enhancing beauty, getting rid of allergies, and so on. Once you remove the bee pollen, the honey loses these medicinal qualities and becomes just a kind of a natural sweetener. Honey has tremendous therapeutic qualities and hence there has been great demand for honey all over the world. China, being an enterprising nation, grabbed this opportunity and started producing honey on a large scale. They started using contaminants such as chloramphenicol and so on. Sensing the dangers of using these contaminants, the US banned the entry of Chinese honey in their markets. This left China with huge stocks of honey. They naturally chose the Indian market to dump this honey. They mixed their honey with pure Indian honey containing pollen. They subject this contaminated honey to a process known as ultrafiltration to remove the bee pollen from the honey. This removes all the nutritional qualities of the honey. This pollen-free honey is fake honey. More than three-fourths of honey available in the supermarkets today is fake honey. In case, you require pure honey, you should get it from a recognized apiary. The worker bees produce a substance known as royal jelly. This is a protein-rich paste like substance. The beekeepers feed this royal jelly to all the larvae for the first three days. Subsequently, they feed this jelly to selective larvae that will mature into queen bees. These bees require only 16 days for maturing, whereas the normal drones take about 24 days to mature. This royal jelly contains a particular type of acid known as HAD. This acid is responsible for the queen bee’s growth. The usual raw honey does not contain this HAD. As the bee gathers the nectar from the flowers, the pollen sticks to the hairy legs of the bees. The beekeepers transplant this pollen back to the hives. They set traps in the honeycomb to catch the bee pollen as it drops off their legs. They use this pollen to manufacture capsules, tablets, and jelly. These products have tremendous therapeutic value. Consuming bee pollen supplements give you the following additional benefits. Raw Honey: Some people experience nausea, vomiting, and low heart rate while consuming raw honey. Pregnant women should avoid the use of raw honey. Bee Pollen: There are instances of gastrointestinal problems, liver damage as well as chronic allergies such as neurologic and hypereosinophilia in people consuming bee pollen. Pregnant women should avoid bee pollen as well. Raw Honey is also known as Organic honey. It is the purest form of honey. Raw honey has the many benefits of it helps you to maintain your fitness and health and it also helps you to fight against the problem your skin is facing it also help in increasing your fairness. As I have used it for my fitness purpose as it is not easy to get the raw honey but I have got it and I am amazed by its purity.